This is a very nice series about a group of children that always, a-l-w-a-y-s, fall into adventure. The characters are lovable and the settings very imaginative and fascinating. 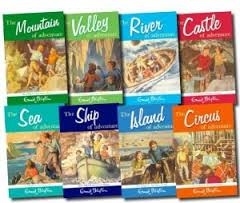 A good series for an Enid Blyton lover because it is very typical of her to write about a few very smart children that fall into adventures and make the world a better place. The children are delighted as they have plans to fly in their friend Bill's plane - and at night! But everything goes wrong when they hear gunshots and then find themselves in the wrong plane! They land in a deserted valley and slowly try to find out the mystery of the place - and find the legendary treasure before the bad guys. Blyton writes well. The general plot is marvellous and the little details even more so. I like the descriptions of the lovely nature - the strangely-shaped rocks, enormous mountains, the waterfall, and the swinging curtain of ferns that hides a little cave. A good read for a rainy afternoon.